Well, at least it will be for those hoping to make a big splash this season, thanks to East Park’s new mega-wave pool. It also happens to be southwestern Ontario’s biggest. According to General Manager Alon Shatil, the new edition has really helped round out the facility, which had been missing a little something. On Thursday, June 28, guests can enjoy a sneak peek of the new digs from 4 p.m. to 7 p.m., while East Park’s first official day of summer follows on Friday, June 29 with the waterpark and wave pool open every day from noon until 7 p.m. through until Labour Day. For those who have gotten to test the waters, reaction has been phenomenal. Now complete, East Park’s waterpark is designed for casual fun and thrill seekers of all ages. Guests can cool off on the accessible splashpad, seven water slides including the 55 ft.-high bullet slide, and the 2.5 storey waterclimber with a tipping bucket. In addition to the waterpark, the East Park Executive Golf Course continues to be open daily. The 18-hole landscaped course was designed by renowned golf architect Robbie Robinson to challenge beginners and seasoned players. With the estimated popularity of the new waterpark facilities, the park is further catering to guests with a new parking lot exclusive to golfers. Food and beverages are served at two indoor café/bar areas with outdoor licensed patios, as well as the waterpark’s outdoor Tiki Bar. In addition to day rates, East Park offers seasonal passes for its golf course and waterpark. The entire waterpark and the wave pool can both be rented for private events, while kids ages five to 16 can play and meet friends at different summer camps in their age groups. 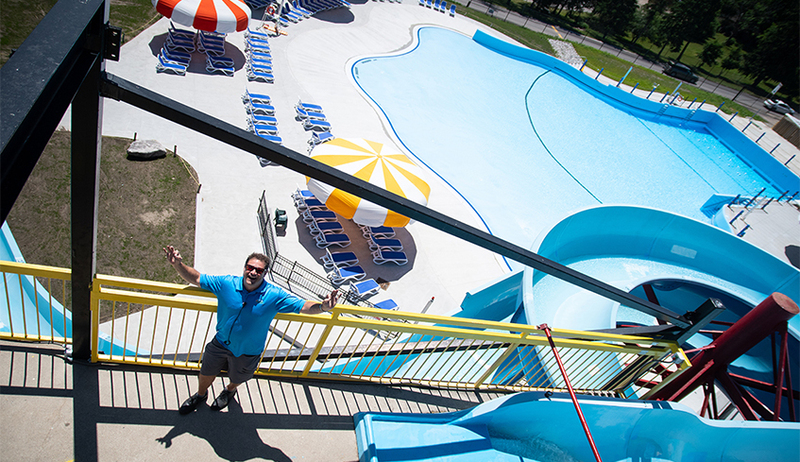 With the project complete and the facility open and ready for summer crowds, Shatil maintained his is the best job in the world. For more information, visit www.eastparkgolf.com.